These days it’s possible for any jerk with a Fender Squier, a peace button for a pick and a bootleg copy of Garage Band to create a CD. And wading through the mountains of discordant dreck to find that one diamond in the rough can be daunting, if not downright depressing. “Cruisin’ With Monk,” another Johnson original, perfectly captures the sly wit, devious harmonic sensibilities and idiosyncratic phrasing of the great pianist and composer to whom it pays homage. He further demonstrates his affinity for our rich jazz heritage with his interpretation of “All the Things You Are,” where he employs a vibraphone sound on his synthesizer. To my mind, the highlight of the album is the hypnotic and indescribably luscious “Little Ones,” a composition utilizing shifting modes and pentatonic scales that feel as if they arise directly from the depths of our subconscious. Among the many tunes I wish I had written, “Little Ones” is right at the top of the list. Throughout the album, Mr. Johnson displays a rock-solid grounding in traditional jazz, but he has forged such a distinctive individuality that he never sounds derivative. It is indeed rare to encounter a truly original new voice in jazz, and rarer still to find one that makes such a contribution to our great jazz heritage. But don’t take my word for it. 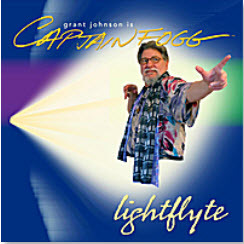 Check out Grant Johnson’s lightflyte for yourself.